You have two payment options: $89.99/month (12-months) or $997.00 (one-time). You own the Evolution Home Gym upon completion of payments. You will also get one-year complimentary access to the online programs with both options. After the first year, access to the online programs is $19.99/month or $99/year. 2) Upon completion of your transaction, our team will reach out to arrange delivery, set up, and demo/training session. 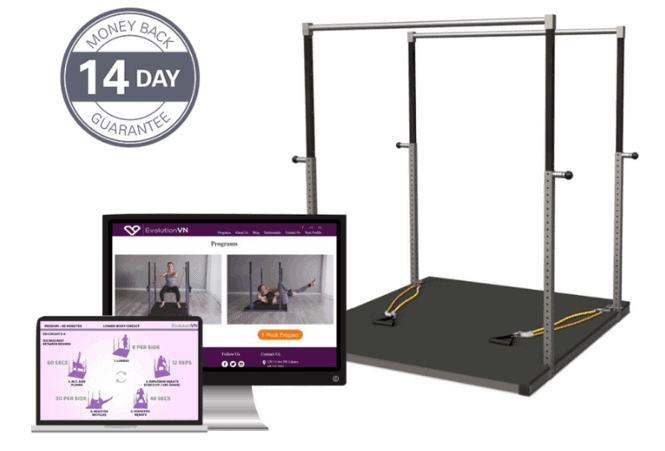 3) We offer a 14-day money back guarantee if you’re not 100% satisfied with your Evolution Home Gym. There is a flat fee of $50 for all returns. The Evolution Home Gym and all accessories must be returned in original condition. Please contact admin@evolutionVN.com to arrange pick-up.